Next up in my spotlight series on books in the excellent Aurora Award ebook bundle is Dave Duncan's West of January. Shortly after I started writing professionally, I sat on my first panel at a genre convention, an unknown among established pros. One of my fellow panelists was Dave Duncan, and I still remember his gracious welcome to a newbie. Dave is an international best seller and an acknowledged master of epic fantasy and science fiction, with fifty novels and over a dozen series. Last year, Dave was inducted into the Canadian Science Fiction & Fantasy Association Hall of Fame. 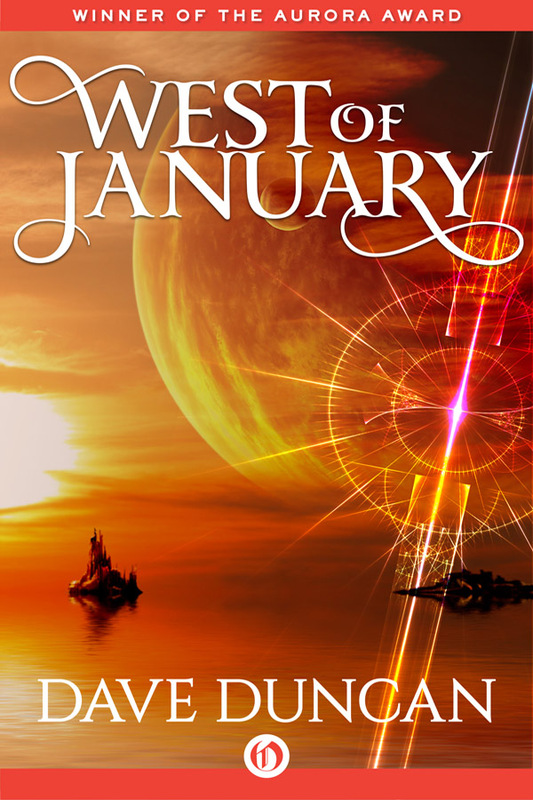 West of January is a standalone SF novel and a great introduction to his work. It also represents the earliest Aurora Award winner in this bundle, and I'm thrilled to be able to include it. Set on a distant planet, far in the future, West of January tells the story of a world in which the sun moves across the sky with agonizing slowness. It takes lifetimes for a region to experience dawn, midday, and dusk, and because of this the planet's population does not remember the catastrophes that occur as the sun moves across the sky—entire civilizations have been scorched into oblivion. The only people who remember the dangers of the past are the planet's "angels"—a people who have tried to preserve past technologies and ancient knowledge, and who work to try to save the other people from the destruction that threatens them when the sun moves. The hero of this book, Knobil, was born among the herdsmen, a primitive civilization in which the men kill one another and exile their sons so that each man can have as many women and children as possible. Knobil, however, is the son of an angel, and his destiny leads him to move among all the other peoples of his world—the beautiful but unthinking seafolk, the cruel slavers, the manipulative traders, and, worst of them all, the spinsters whose deadly secret he discovers nearly too late. This action-filled story of a very strange planet showcases Duncan's remarkable ability to create unique worlds. I hope you'll take a moment to check out this great ebook bundle.